This week's challenge at Dynamic Duos is Mix n Match! 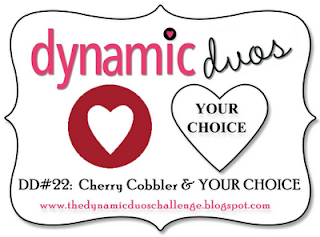 Dynamic Duos picks one color, you pick the other for your creation! 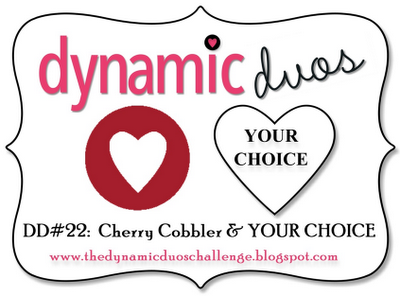 The Dynamic Duo color is Cherry Cobbler. Make your creation with Cherry Cobbler and one other color, neutrals are allowed as well. I chose Cranberry (for Cherry Cobbler) and New England Ivy from Close To My Heart. I also incorporated Colonial White and Kraft as my neutrals. My layered poinsettia was made with help from the Cricut Artiste cartridge. I added "veins" with a stylus to give the leaves more dimension. I went for an aged vintage look with my card. I layered my sentiment onto my stamped background and then sponged on Desert Sand ink. I distressed my kraft paper as well. I stamped the same musical background on the kraft paper and then misted with water, crumpled, laid flat to dry and then applied to my card base. The poinsettia was really simple to make and creates a stunning focal point on my card. It is amazing what a little bit of dry embossing will do for die cuts. You can emboss die cuts with embossing folders for added texture or flip the design over and create your own look with a stylus. I free hand drew in veins on the leaves and then added more distressing to bring my poinsettia to life. Thanks for stopping by! Be sure and stop by Dynamic Duos for some inspiration by the DT and to enter your own creation! The linky closes Thursday at noon (PDT). This is such a classically beautiful BEAUTIFUL Christmas card, Allisa. Wonderful take on the challenge. What a pretty poinsettia Allisa! I love red and kraft together. Your pretty musical label is the icing on the cake here! Such a lovely Christmas card - the colors are so rich against each other! Thanks so much for playing along with us at the Simon Says Stamp challenge this week! This is one gorgeous Christmas card Allisa, you have made my sketch sing! Love the poinsettia. What a beautiful poinsettia, Allisa! And the music and distressed background are perfect to show it off! Thanks for sharing it with us at Merry Monday! 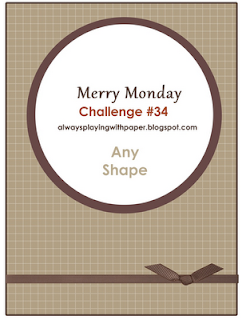 Thanks for playing in our Vintage Challenge this week at Card Crafters Circle. Love your pretty flower...it has the WOW Factor... and the card colour combination, wonderful card!!! Gorgeous card as usual! The poinsettia is the perfect focal point. Beautiful poinsettia. I love the music background. The colors are lovely. Lovely card. Your poinsettia is beautiful. Thank you for joining us at Card Crafter's Circle this week and entering our challenge. Fabulous card Allisa, I love the papers you used and the poinsettia is wonderful. Thank you for joining us this week for Merry Monday. Very pretty card! 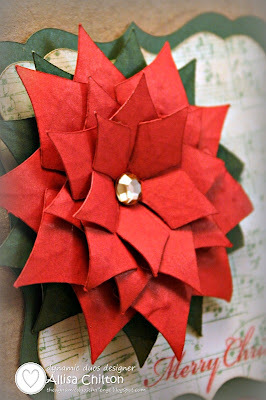 I love how you layered the poinsettia for a great 3D effect! I also like the music script background. Thanks for the inspiration! What a pretty Christmas card, Allisa! Your poinsettia is wonderful with your musical note paper! Love this! Lovely! That poinsettia is beautiful. Thank you for playing along at H2H. gorgeous card... love that poinsettia! thanks for playing along with the shining the light challenge! This is a very pretty card. Lovely poinsetta and fab christmas colours. Lovely. Thanks for joining in with us at Craftymessers. This is a really beautiful card Allisa! The poinsettia is one of the most gorgeous ones I've seen. Thanks for joining us at Merry Monday this week! Oh how beautiful!! I just love your poinsettia and the added embossing to it with the stylus!! The musical background is perfect. Thanks for joining the ODBD Shining the Light challenge this week!! Beautiful!! I love the large poinsettia...it just pops right off the card! Thank you for taking on our embossing challenge at Frosted Designs this week! 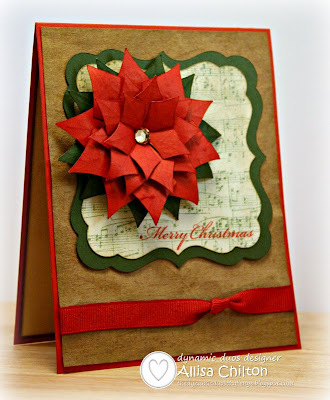 I just love that poinsettia and that you embellished the inside of your card. This is beautiful! Lovely colours and poinsettia. Thanks for playing along with us at Frosted Designs! I just love your card. That poinsettia is amazing!